As many of you may know, "Jersey Freeway" is a term applied to a type of multilane divided road whereby private access is allowed but at-grade access across the median is prohibited. Instead, access from one side to the other (and all "left turns") is provided via interchanges and overpasses. This type of road is often found in New Jersey (hence the term), but examples exist elsewhere. - US 1 on the north side of Boston, from the end of the Northeast Expressway north to past the connector to the I-95/MA 128 Loop. If it wasn't for a jughandle/U-turn just north of the connector, the Jersey freeway would extend further north to the interchange at I-95/Exit 50. - BYPASS US 1 in Portsmouth, NH, from the traffic circle at US 4/NH 16 north to the Sarah Mildred Long Bridge. - US 1 through Bath, ME, from State Rd (the end of the full freeway from Brunswick) to the ramps to Middle St. Technically US 1 continues as limited access across the river, but from Middle St east across the bridge is undivided road. US 1 has a very brief Jersey Freeway between the Granite Run Mall in Lima and the Media By-Pass. There are several sections of US 22 between Ebensburg and Delmont, Pa., that are configured like this. 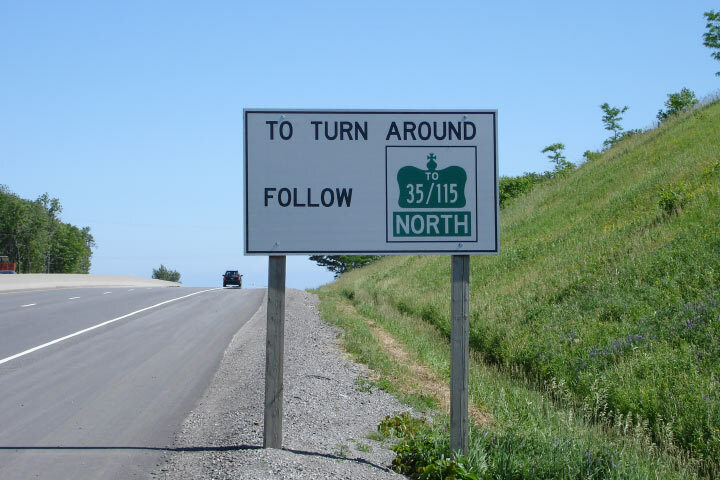 And it appeared that portions of US 11/US 15 north of Harrisburg are as well; however, it was dark when I drove that route and all I saw was frequent U-turn signage. And it appeared that portions of US 11/US 15 north of Harrisburg are as well; however, it was dark when I drove that route and all I saw was frequent U-turn signage. This has backwards jughandles (you turn left into it and cross the other direction at-grade). US 1 along the shore of Rhode Island is up for debate. There are no direct crossings, but there are U-turns in the median. If you look at them as individual left-exits and left-merges, I say it counts. for some reason, I remember those "TEMPORARY" side roads being closed off. Am I mistaken? that said - I-40 around the NC/TN line. I-5 in the Grapevine. I-8 in a few spots in western Arizona. And probably others I am not recalling successfully. There's lots of these on dual carriageways in the UK, as cross-median turns have been blocked off. thinking of the A1 between Peterborough and Doncaster and the Northern Irish A1 between the A101 and Newry in particular. US 101 south of Petaluma, CA is like that, and so is US 70 in Raleigh, NC...nothing really like that in Florida. I recall N152 in Spain used that type of setup in a few places, a few stores and gas stations between Montserrat and Barcelona. But I think that was used because some of the terrain had steep grades and curves in those mountain foothills. Altenate US 90 (Old Spanish Trail/S. Main Street) in Houston between Beltway 8 and just short of I-610 is sort of a "Jersey freeway"...technically, it's a RIRO with interchanges with major roadways. Actually, there are three full out median crossings (two at San Antonio Road, one at Kastania Road where a gas station is), not quite the same thing. More of a (California-style) expressway. US 69 in Overland Park, KS is one where it is aligned on Metcalf Avenue! The westernmost bits of NY 27/Sunrise Highway in Suffolk County are like this. This highway has had no at-grade intersections or even crossovers between the Highway 85 interchange and its terminus at the mainline of Highway 40 (a distance of 22 miles) since about 2009. Another one I'd forgotten about: PA 12 in Reading from US 222/422 to the overpass at PA 183. 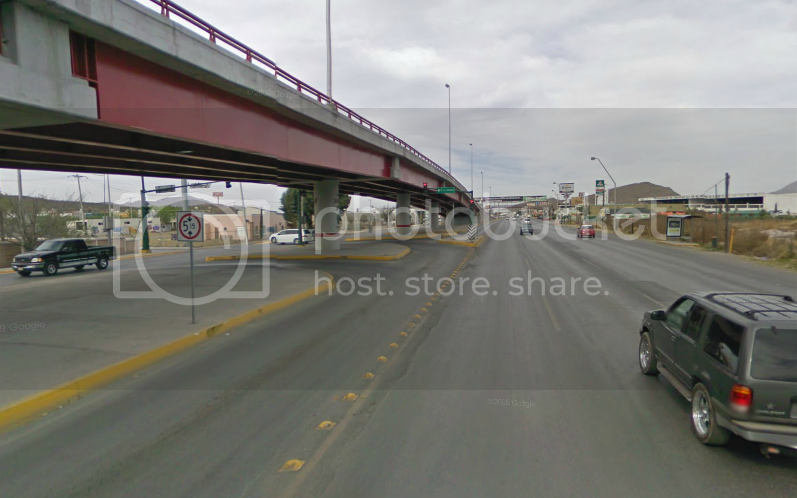 I'm sure I-10 and/or I-20 in far western Texas are also like that. It's been years since I last came through what I used to call "the world's largest nowhere!" I think SR 17 between San Jose and Santa Cruz is one (where it's not a full freeway). While CA-17 does have a center barrier for most of it's length from Los Gatos to Scotts Valley, there are breaks in it to allow left turns onto side roads like at Idylwild Drive, Darrell Road, Glenwood Drive and Laurel Road just to name a few. 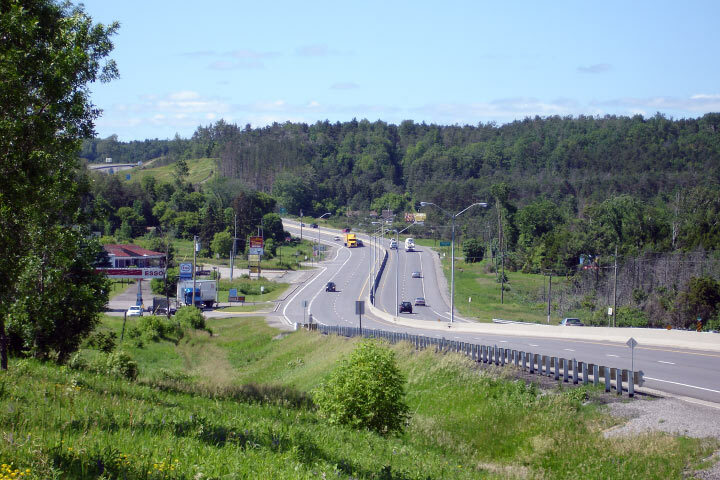 A section of QC-117 is like that, between Mont-Tremblant and Saint-Faustin. U.S. 169 from I-70 in Kansas City past the downtown airport is kind of like this description. Further north it's more of a true freeway closer to where it intersects I-29. Oregon 99W seems to have a few intermittent stretches that act similar - namely between the Tualatin River and Rex Hill, again between Newberg and Dundee, and yet again between Lafayette and McMinnville. However in these sections there is a full median and not just a jersey barrier, so would that disqualify it? I would think that as long as there are no median crossings, it'd fit the description.